Whilst looking recently at one of our patient case books, staff working on the Unlocking the Asylum project came across an interesting diagnosis. Often seen with more prominence amongst the female case notes is what is termed as ‘love affairs’ or ‘love disappointment’. “full of delusions but they have a direct connection with the most important one being that she is engaged to her Music Teacher, and that their marriage has been ordained in Heaven, and that although he has never proposed to her, she knows it through a particular hymn which she hears at Church”. Ann’s case file, detailing her behaviour leading up to her admission. The case notes go one to provide descriptions of her at intervals during her time at the hospital, in Aug 1890 she is described as lazy and indolent, in November 1890 it is noted that she accused the nurses of all sort of fancied slights and insults, and that she is selfish and self-willed. On 16th Apr 1891 on the orders of her Father she was transferred to Portsmouth Asylum, the case notes stating that none at the asylum regretted the steps he was taking. 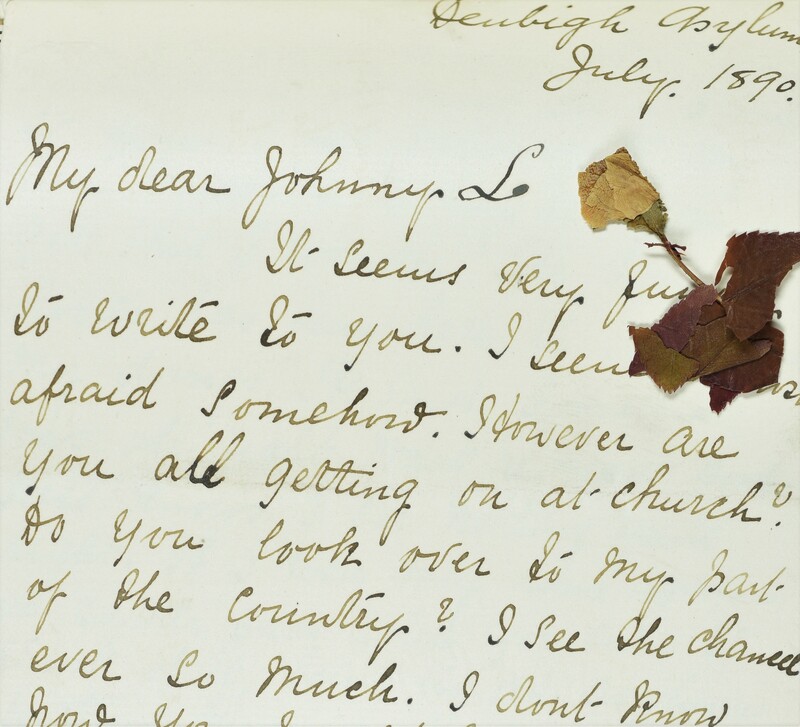 A letter written by Ann to her music teacher in July 1890, including a pressed flower. “My dear Johnny L. I don’t know what you would do if you were here. I see nothing quite right, if only I were home again, it’s rather sad when you come to think of it, being in an asylum without knowing the reason for what I’m here”. Ann was discharged from the Portsmouth Asylum on 6th July 1891, unfortunately after this date we have no further information of what happened to her. February marks the start of LGBT History Month, a month long celebration of Lesbian, Gay, Bisexual and Transgender (LGBT) history. Before the late 20th century those who identified as LGBT were often perceived as suffering from a mental health condition. It is therefore unsurprising that staff working on the Unlocking the Asylum project, which is aiming to catalogue the records of the North Wales Hospital, have uncovered a number of references to LGBT patients who were admitted to the hospital because of their sexuality. The North Wales Hospital as it would have been for patients in the 1950s, photograph by Ronald Thompson. 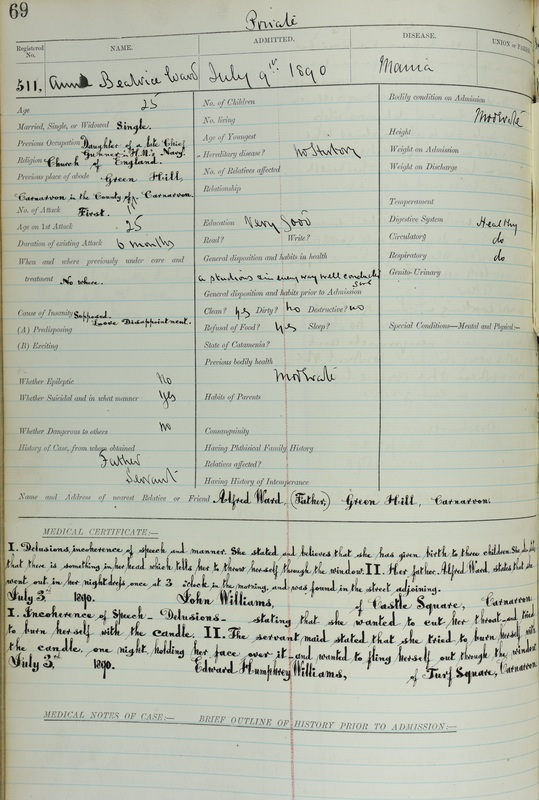 Amongst the post-1948 series of patient records there are a number of patients admitted to the hospital with a diagnosis of homosexuality. Some of these patients voluntarily admitted themselves to the hospital looking for a ‘cure’ for their condition. As male homosexual activity was illegal up until 1967, many were afraid of the legal consequences of their behaviour, which could see them imprisoned for up to seven years. One patient admitted in the 1950s told Doctors that he did not mind giving up his homosexual activity in view of the difficulties it would cause him from a legal point of view. The main ‘treatment’ offered to patients at the hospital during this time was Stilboestrol, a form of chemical castration. According to Doctors this ‘treatment’ would eliminate sexual desire and make it possible for a patient to live within the law. One patient who was admitted in the early 1950s was offered three choices, he could accept his homosexuality and run the risk of the legal consequences; he could be celibate; or he could have his sexual desires removed chemically by use of Stilboestrol. Some patients did not wish to be ‘cured’ of their homosexuality, one patient admitted himself because he wished to escape from pending police action. The Doctor ‘treating’ the patient prescribed a course of Stilboestrol although he said did not feel optimistic of the outcome of such a treatment in this particular case. There are also records relating to patients who identified as lesbian, bisexual, and transgender. Several patients declared that they were bisexual, and there are a number of records of patients who identified as lesbian. There are also a number of patients who identified as transgender or transsexual. One patient wished to be a female and wanted recognition of their real gender and identity, whilst another wished to physically transition from male to female. One patient felt as though they didn’t belong to either gender. The North Wales Hospital collection is a vital resource in bringing to light the experiences and histories of those who identified as LGBT, during a period when these identities were perceived as psychiatric disorders. To find out more about LGBT History Month and events in North Wales please visit the LGBT History Month website. A calendar of LGBT events taking places in Wales can be found on the LGBT History Month website. Please note that due to NHS regulations records of patients containing sensitive personal information are closed to the public for 100 years. These records may be available to researchers who belong to an academic institution upon request. 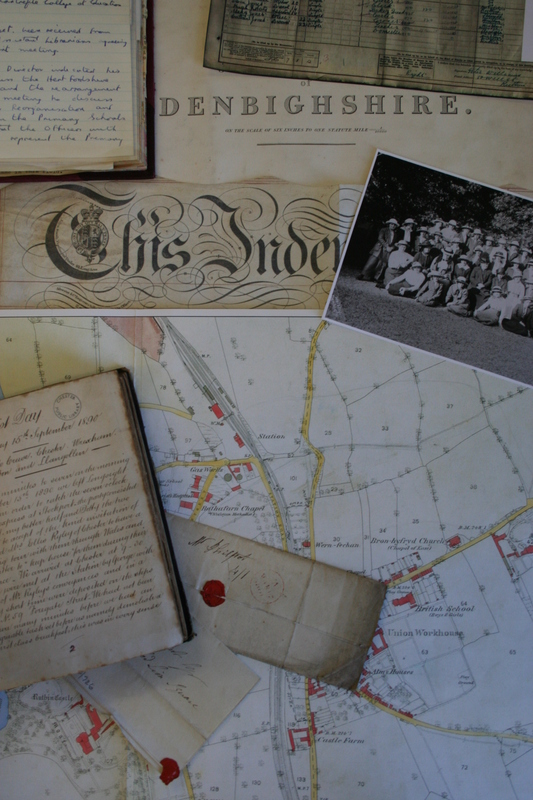 If you are interested in using the North Wales Hospital collection for academic research please contact us.